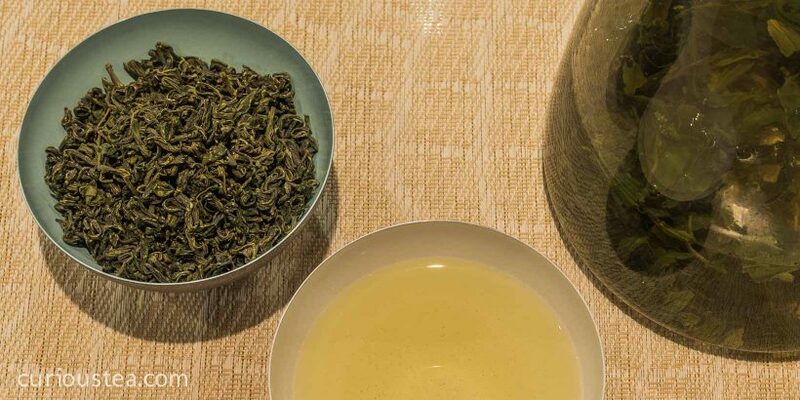 In July 2015 we are featuring the following varieties for our tea subscription club: two special greens from Anhui in China – Jin Zhu Mao Jian and Jin Shan Shi Yu; there is the outstanding Silvertips from Sri Lanka and a strong dark oolong from Gopaldhara estate in Darjeeling. We hope you find the information below helpful in your tea tastings. Mixed: Jin Zhu Mao Jian and Falcon Lanka Silvertips. Welcome to another month of Curious Tea subscriptions! We had an exciting time selecting these fantastic teas to share with you. We hope you will enjoy our selection, and to help you along with the tasting, here is some further information on all teas featured in our July Curious Tea boxes. Jin Zhu Mao Jian is an extremely rare and stunning looking tea that comes from the mountains of Anhui Province in Eastern China. Jin Zhu is a village, after which this tea is named, while Mao Jian is a type of tea and can be roughly translated as ‘Tippy’. This name is very apt as when you look at this tea, you can see that it is mostly made out of the top two young leaves of the tea plant plus the buds. The production of this tea requires very careful hand plucking of the best leaves of the plant when they reach optimum condition. The leaves are also plucked very early in the season when they are most delicate. After plucking the leaves are hand-rolled and gently pan fried in order to ensure the two leaves and the bud stay together resulting in visually appealing large tea leaves. We selected this Jin Zhu Mao Jian tea for our July Light and Mixed boxes. When brewed, the leaves open up and you can see whole large green leaves with little buds in your pot that are used to make this great tea. The liquor produced is very bright and light in colour, reminiscent of a white tea. 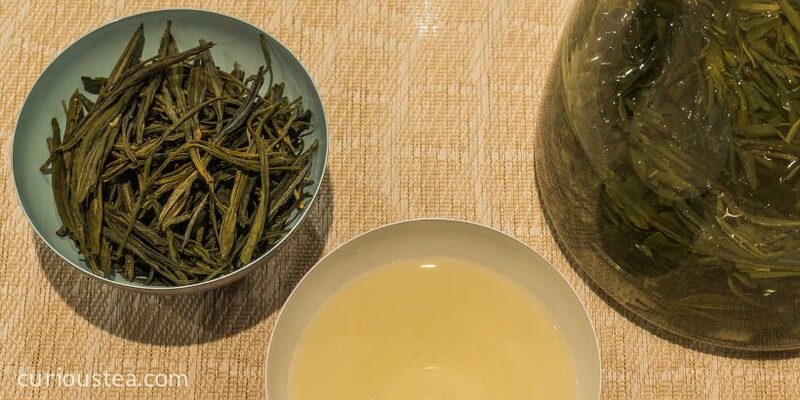 The flavour of this tea is very light, again somewhat similar to a white tea, having a fragrant smooth and slightly sweet taste with lingering peachy undertones. This tea is best brewed at 80°C for 2-3 minutes and can be brewed multiple times. 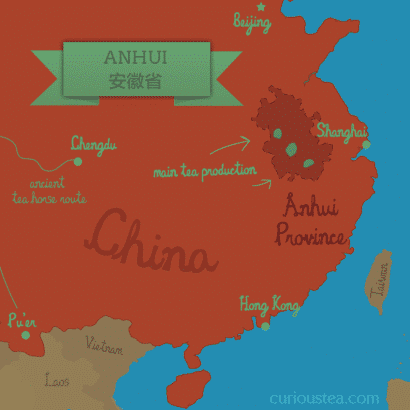 Jin Shan Shi Yu is another special tea that also comes from Anhui Province in Eastern China. Jin Shan Shi Yu can be translated as Gold Mountain Timely Rain and it is grown around the Jin Shan (Gold Mountain) village. This tea is plucked at a very specific time of the year and only when conditions are ideal. As the name suggests, the timing of the picking coincides with the first spring rains and it is usually right after the rains when the leaves are young and new buds appear on the tea plants. Another possible explanation for the ‘Timely Rain’ name is that the leaves have a distinctive curled raindrop-like shape. We selected this Jin Shan Shi Yu tea for our July Light Curious Tea offering. The leaves of this particular tea have a distinctive curled shape, dark green in colour and are tightly twisted and rolled. The liquor produced is a little bright and light yellow-green in colour. It has a very smooth slightly vegetable and chalky taste with a sweet character and mild smoky undertones. A very delightful cup of tea that has a very typical yet unique profile for a Chinese green tea. This tea is best brewed at 80°C for 2-3 minutes and can be brewed multiple times. This tea would be great cold – you can try cold brewing it for a lovely cup of iced tea. Alternatively brew as per our guidelines or according to your preference, let it cool and refrigerate to enjoy a very refreshing and healthy cup of iced tea on a hot sunny day! Ceylon New Falcon Lanka Silvertips is an extremely well made black tea that comes from the Falcon Lanka tea estate in Ratnapura, Sri Lanka. The tea farmers in Sri Lanka have had a difficult recent past, with the government encouraging more farmers to switch to CTC (crush, tear, curl) methods of tea production in the 1990’s, trying to capture the huge CTC market. CTC tea is normally used to fill tea bags, so the move was away from quality and onto quantity. This switch from orthodox methods was a big failure as Sri Lankan teas could not compete with cheaper CTC teas from other large and well-established CTC tea growing countries, such as India, Kenya and Malawi. This move also damaged the reputation and quality of Sri Lankan tea, resulting in many farmers choosing to eventually abandon CTC production in favour of orthodox methods of tea production. 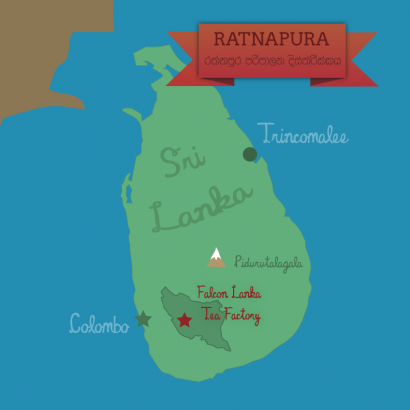 Now Sri Lanka is rightly regaining its status as a major exporter of high quality orthodox teas and there are more and more interesting and exciting producers of high quality Ceylon teas, such as the Falcon Lanka tea estate. We selected this Ceylon New Falcon Lanka Silvertips tea for our July Dark and Mixed Curious selection. The leaves of this beautiful tea are very well made and are black and wiry with a distinctive silver spine. The liquor produced is rich gold in colour and has a lovely aroma. It has a very smooth flavour that is slightly malty and mild in character. There are undertones of orange zest and honey to make things even more interesting. A very distinctive cup of tea that is hugely enjoyable. This tea is best brewed with water that has just come off the boil, for around 2-4 minutes. Best taken without milk or sugar but you can experiment with a little honey and/or lemon. Gopaldhara Red Thunder Oolong is a very unique tea that comes from the Gopaldhara Tea Estate in Darjeeling. 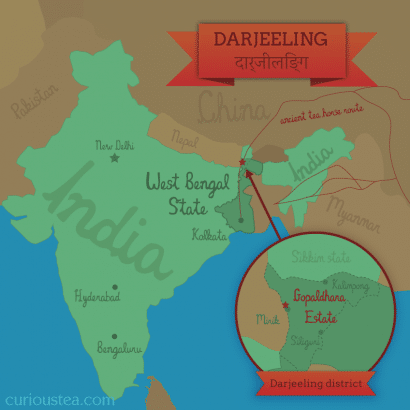 Nestled in the Mirik Valley in the Himalayan foothills Gopaldhara is one of the highest tea estates in Darjeeling with elevations of between 1,700m and 2,100m. It is also renowned for producing teas of exceptional quality and unusual character. Gopaldhara Red Thunder Oolong is unique in that it is picked late in autumn when leaves are starting to naturally wither on the tea plant as the weather turns colder and they start to get slightly frosted. 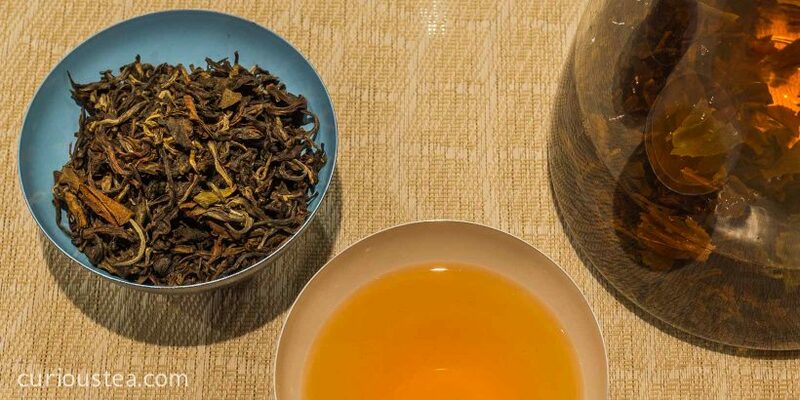 This method of very slow leaf fermentation combined with slow and long oxidation process that follows makes this oolong tea truly unique amongst Darjeeling teas. Needless to say, this is a very laborious process that has to be carefully controlled so that the leaves are plucked at just the right time, making the yield very low and this tea a very rare one indeed. We selected this Gopaldhara Red Thunder Oolong tea for our July Dark boxes. 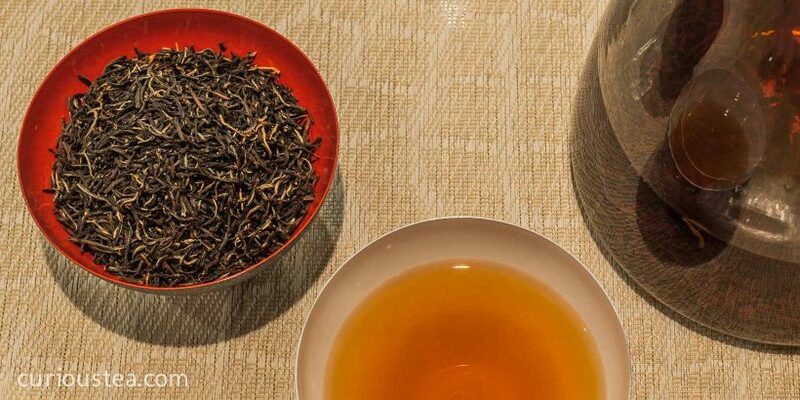 The large leaves of this tea are very beautifully mixed in appearance and produce a light liquor with lovely aroma. When brewed the character is Darjeeling-like yet very distinctive. The flavour is very smooth and complex, with typical Darjeeling floral notes combining with the more unusual warm, peppery and woody ones to create a truly captivating tea experience. This tea is best brewed at 90°C for 3-5 minutes. Savour this exceptional tea on its own, or try combining it with your favourite dishes that normally call for a glass of red wine – a tasty and healthy substitute! We really hope that you enjoyed the tea club selection for July and are looking forward to what we have in store for your August selection. Incidentally, if you are reading this but do not receive to our monthly gourmet tea selections and would like to receive future boxes, you can sign up in just a few clicks. We ship worldwide from the UK. As always, we want to hear from you, so if you have any questions, suggestions or just want to chat about tea, contact us at contact@curioustea.com, via our Facebook page or via Twitter. This entry was posted in Monthly boxes and tagged black tea, China, Darjeeling, green tea, India, oolong, Sri Lanka, tea on July 16, 2015 by Curious Tea.